New construction home is anticipated to be ready in winter 2018. 3 Br + 2.5 Ba + 2 Car attached garage. Private gated entry with spacious patio and deck for outdoor living. Stunning open kitchen white cabinets, quartz counters, stainless steel appliances & Gourmet Island. Living, dining areas and master suites deliver elegance. Open floor plans, dramatic large scale windows, indoor-outdoor living amenities to express Ã¢â‚¬Å“your plansÃ¢â‚¬Â and lifestyle. Please read supplement for more detail. Distinctively urban architecture, Decorative metal siding, clean-lined brick veneer and wood accents per architectural plan, Smooth panel roll up garage door. Therma Tru front door in a designer selected color scheme with KwiksetÃ‚Â® Tavaris polished chrome door hardware and satin etched glass, Composition shingle roof for a clean modern look, distinctive European style white Thermofoil cabinetry with stainless steel pulls , Smooth finish five panel interior doors with KwiksetÃ‚Â® Ladera polished chrome hardware, Sleek door casings and 3.5 inch baseboards, Advanced Category 5e wiring for high-speed computer and telephone connections, USB/Duplex outlet at kitchen,6 inch x 6 inch white ceramic tile on shower walls with 2 inch x 2 inch white ceramic tile on shower floor, Cultured marble countertops with square edge with 4Ã¢â‚¬Â back splash, Moen Ã‚Â® Align series hardware trim in shower and sink, Conduit for a future electric car charging station *Conduit only, trim not included, RinnaiÃ‚Â® tankless water heater with expansion tank, vinyl dual-pane windows with low-e glass. Element and Z at Millenia, where urban living is transformed into a complete lifestyle. A network of shops, parks, and restaurants intertwines as the epicenter of an upbeat culture. 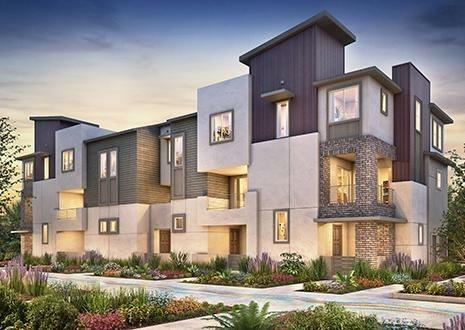 This exclusive neighborhood is truly a mini-metropolis unto itself, tucked away in San DiegoÃ¢â‚¬â„¢s growing South County. Every home in Element and Z is marked by exceptional design, characterized by fresh aesthetic composition and practical functionality. The amazing location blends seamlessly into your active lifestyle. Listing provided courtesy of Shea Advantage. Listing information © 2019 San Diego MLS, Inc.